The teams on the NI Autonomous Robotics Competition have reached milestone 3. Maxon Motor has developed a customised ‘high-vacuum’ brushless DC motor for Instrument Design Technology for use in the Diamond Light Source particle accelerator in Oxfordshire. The motor has been used in the synchrotron’s new double crystal monochromator, which is helping scientists understand the Earth’s climate, atmosphere and volcanic activity before the birth of humankind. Maxon redesigned its brushless, stainless steel EC22 heavy-duty motor — originally intended for subsea oil applications. Instead of epoxies, the engineers assembled the motors using micro laser welding. The motor has delivered high performance and excellent reliability. It is tolerant of extremely high temperatures — this has been essential as the high vacuum would make dissipating heat by convection impossible. The construction of the motor means it is not susceptible to outgassing. The 22mm and 32mm right angle gearheads are available in either a 4:1 or 31:1 ratio, which may be mounted directly onto many of maxon’s brushed/brushless motors OR stacked on different ratios of maxon’s GP22 and GP32 planetary gearheads. This results in a wide range of achievable gear reductions. The motor and gearhead combinations are ideally suited for a variety of applications particularly where an output shaft perpendicular to the motor axis is desired. 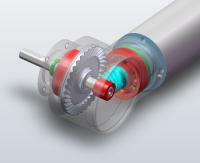 Encoder Technology from maxon motor on Board Curiosity. The landing of the Mars rover Curiosity took seven exciting minutes. Now it will be looking for signs of life on the Red Planet. maxon encoder technology will pay a part in the successful excursion of the rover. This is the continuation of the success story of maxon products in outer space and on far away planets. The new Mars rover Curiosity ended its six month long journey to Mars with a successful landing on August 6th 2012. As everything went according to plan, the control center at Jet Propulsion Laboratory (JPL; California) erupted in cheers. “It was a wonderful landing, everything looked extremely good” said Adam Steltzner, NASA engineer and lead scientist of the JPL landing team, enthusiastically at a press conference. This is the start of a new, exciting excursion on the Red Planet. In contrast to the rovers Opportunity and Spirit, Curiosity can travel further distances on its six wheels and run longer without solar energy as a radionuclide battery gives energy for years. The plan is that the rover shall explore the immense Gale Crater on Mars for signs of life, for two years. And this with impressive equipment on board – a gas chromatograph will hopefully uncover organic compounds; a spectrometer will analyze the composition of rocks which will be collected by the two meter long robot arm and a neutron source will look for hydrogen in the ground. “From Mars via the International Space Station to the moon“ On its „Mission to Mars“ Curiosity also has maxon products on board. The MR Encoder technology is built in to the electromechanic joints of the rover. The magnetic sensors are mounted on the drive shafts and are responsible for controlling the motors. Apart from that, maxon development services for the drive systems have also played a part in the 900 kilogram rover being able to carry out its Mars Mission successfully. 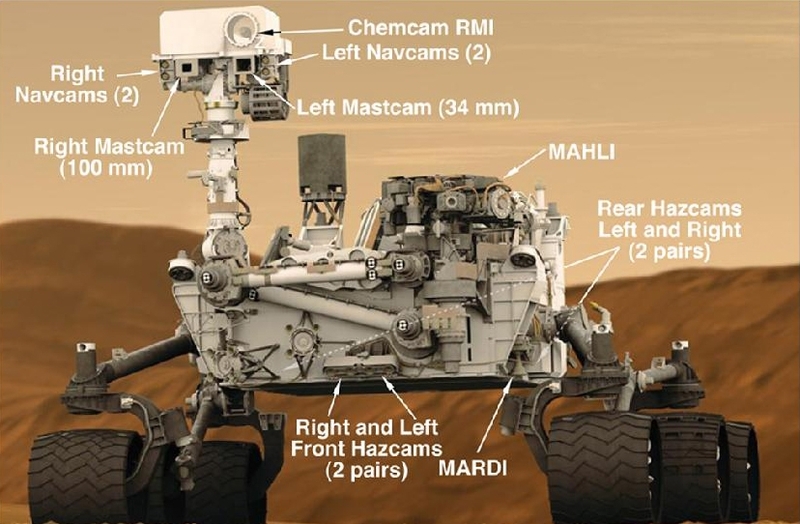 Curiosity’s little brother Opportunity is still on its journey on Mars; for the past 8 years the rover has been exploring Mars with the help of maxon motors. A further success for maxon motor is the SpaceX-Mission to the International Space Station (ISS). Amongst other things, brushless EC motors have been used to move the 2 solar panels which always have to be facing the sun in order to supply the Dragon Capsule with power. More flights to the ISS are already planned; the next in September 2012. In 2015 a further rover will be sent explore Mars for the Exomars Mission. The moon is also in sight – at least for the Chinese Lunar Exploration Program (CLEP) when an exploration rover will be sent to the moon. Numerous research satellites nearer to Earth will also be fitted with maxon drives. The next start of such a satellite its the ESA Sentinel 3 which will fly into space in 2013. Here maxon motors will be used, for example, in a possible emergency to control and secure the fuel valves. The new maxon Catalogue 2012/13 has arrived. 2012, maxon motor presents new motors, gearheads, servo controllers, digital positioning controllers and integrated MILE encoders. The new catalogue of the specialist for high-precision drives and systems is now available: maxon motor has been investing in the constant development of innovative products for many years. And this year is no different – there is an abundance of new products. 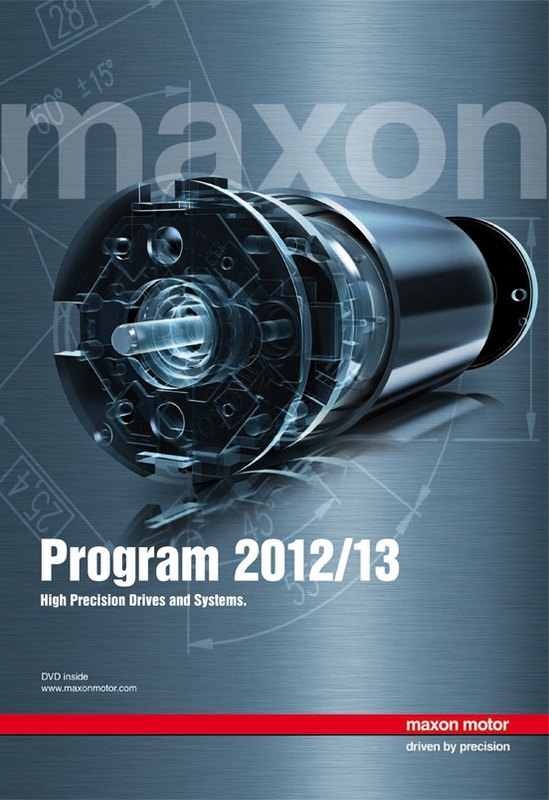 The 390 pages of the maxon Catalogue 2012/13 are packed with technical data of motors, gearheads and sensors. Additionally the catalog includes all details on intelligent control electronics for DC and EC drives. The maxon Catalogue 2012/13, with its approx. 3100 products, represents the entire product program of the Swiss manufacturer of precision drive systems. On 390 pages, more than 1720 brushed and brushless DC motors, 993 gearheads, 199 spindle drives, 65 sensors, diverse drive electronics and much more are presented. On a broad scale, many innovations expand the maxon product range: For example, the new GP 22 HD planetary gearhead complements the robust EC 22 HD (Heavy Duty) standard motor perfectly – this “power couple” is suitable for all extreme usage conditions – from thousands of meters under the earth to outer space. Some of the other innovations include new flat motors such as the EC 45 flat (Ø 45 mm, 70 W) and EC 60 flat (Ø 60 mm 100 W), flat motors with integrated MILE encoders, the GP 26 A (Ø 26 mm, 0.75-4.5 Nm) and GP 16 C (Ø 16 mm, 0.2-0.6 Nm) planetary gearheads, the GP 16 S (Ø 16 mm) spindle drive, the ESCON 36/2 and ESCON 50/5 servo amplifiers and the new programmable EPOS3 EtherCAT digital positioning controller. On the DVD provided with the catalogue, the reader can browse through the maxon Catalogue and save or print data sheets. Additionally, all dimensional drawings are available in DXF and STEP format and can thus be imported into any CAD system. The DVD also contains the maxon selection program (msp), which helps the user to quickly and easily select the optimal drive solution from the vast range of possible combinations. To enable easier assessment, visual representations of the variants and alternatives are shown. Additionally, the “Selection Guide” has been supplemented: Now the user can immediately see which accessories are still required for connecting the selected motor with the recommended electronics. The msp is the ideal tool for interested customers who want to identify and solve a drive problem by themselves.